ALBANY, N.Y. -- The New York State Council on the Arts together with the Preservation League of New York State and the Robert David Lion Gardiner Foundation announced 10 regional recipients of the 26th round of grant funding through Preserve New York at a news conference at the Ontario County Historical Society. "At its July 2018 meeting, the Preserve New York panel selected 31 applicants in 21 counties around the state to share $251,616 in funding," said Jay DiLorenzo, President of the Preservation League. "As always, the competition for these funds was intense. We are delighted to help advance the preservation efforts of these organizations with timely funding from Preserve New York." Wyoming County: Silver Lake Institute - $6,000. Preserve New York, a competitive historic preservation grant program, was established in 1993 as a partnership between the Preservation League of New York State and the New York State Council on the Arts (NYSCA). Preserve New York enables the Preservation League to support arts centers, historic sites, music halls, theaters, libraries and other cultural not-for-profit or municipal entities that steward historic buildings in every one of New York's 62 counties. "We recognize the importance of preservation work to help maintain the historic and cultural richness of New York," said Katherine Nicholls, Chair of the New York State Council on the Arts. "NYSCA is proud to partner with Preservation League of New York State to provide organizations and municipalities across the state with financial support to advance their preservation initiatives." "The Robert David Lion Gardiner Foundation is delighted to have partnered with the Preservation League of New York State to specifically aid our Long Island historic stewards," said Kathryn M. Curran, Executive Director of the Robert David Lion Gardiner Foundation. "Thanks to the League's record of making effective preservation grants through Preserve New York and TAG, our program partner, the New York State Council on the Arts (NYSCA), has increased regrant funding significantly over the past several years," said Erin Tobin, the League's Vice President for Policy and Preservation. "At the same time, in response to growing demand, the League has successfully lined up additional support to leverage NYSCA funding and League resources." Albany County (2): Albany County Historical Association - $9,600; Shaker Heritage Society - $10,000; Broome County: Nanticoke Valley Historical Society of Maine NY - $5,682; Chautauqua County: Jamestown Renaissance Corporation - $9,228; Chemung County: Elmira College - $2,800; Dutchess County: Dutchess County Art Association d/b/a Barrett Art Center - $15,650; Jefferson County: Thousand Island Park Landmark Society - $9,000; New York County: Renee & Chaim Gross Foundation - $12,000; Nassau County (2): North Shore Land Alliance - $9,750; Village of Rockville Centre - $11,200. 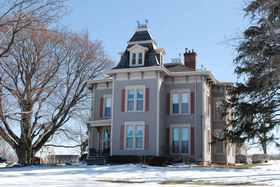 Also Putnam County: Tompkins Corners Cultural Center - $9,600; Queens County: Greater Ridgewood Restoration Corporation - $8,000; Rockland County: Village of Pomona - $5,200; Schenectady County: Schenectady County Historical Society - $10,000; Suffolk County (4): Sylvester Manor Educational Farm - $10,000; Madoo Conservancy - $8,000; Commack Union Free School District - $7,620; Marion Carll Farmhouse Building Condition Report; Smithtown Historical Society - $5,800; Warren County: Town of Horicon - $5,200; and Westchester County: Rye Historical Society - $10,000. With the announcement of the 2018 awards, support provided by Preserve New York since its launch in 1993 totals more than $2.6 million to 407 projects statewide. A League study completed in 2016 demonstrates that Preserve New York funding has catalyzed preservation efforts across the state and leveraged many times its value in cash and donated services. Grants have led directly to the preservation of historic buildings, neighborhoods, and landscapes in every county of New York State. For more information on the Preserve New York grant program, please call 518-462-5658 x 10 or visit the League's website at www.preservenys.org.